We remember the reforming archbishop, the Syrian, Theodore of Tarsus, Archbishop of Canterbury (669-90). Reculver is an ancient foundation, the Anglo-Saxon Chronicle relates that in the year 669 King Egbert of Kent gave Reculver to Bassa the priest to build a minster there. Previously King Hlothere of Kent gave land on Thanet and at Sturry to Abbot Berhtwald and his minster of Reculver, in a charter of 679, the oldest to survive as an original, and said to be issued ‘in the city of Reculver’ (in civitate Reculf), which was by this date an ecclesiastical civitas within the walls of the Roman fort. The minster church of Reculver exhibits the kind of features that we do not find in work in a later period. The chancel arch, an arcade of three round arches supported by 2 pillars, their shafts of nine cylindrical stones are tapered, and the effect, when one looks at the plate (right) of the east wall of the nave and chancel arch, is very reminiscent of a Roman temple, and it is highly probable that the builders reused Roman columns obtained from a nearby building. These columns thankfully survive having been moved and may be viewed in the crypt at Canterbury cathedral. The church at Reculver does not exhibit Saxon pilaster strips but it does have ‘Kentish’ buttresses which protrude some 2 feet. This is a Syrian feature since the church was built to Syrian ritual and practise by Syrian craftsmen, as the flanking porticus shows. click here to go to the 'British History Online' site on Reculver (exits this site). List of triple chancel arches. * traces only remain, in situ. For more information on the present day site at Reculver click here. St Augustine & Early Churches. Canterbury. Over 400 Saxon churches listed! - an invaluable listing, a downloadable table (unique to this site) which gives information of the known churches in England exhibiting Saxon features and fabric (and with details of those features), a comprehensive listing noted by place name, county, and grid reference; wholly based on H.Taylor's three sterling volumes, "Anglo-Saxon Architecture". 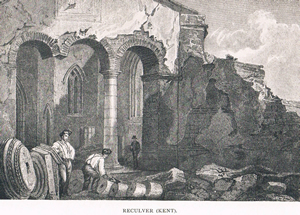 plate above right: Reculver church and the triple chancel arch, during demolition in the 19th century.